What has not changed is the importance of ad relevance (keyword) and landing page experience (again, read keyword relevance). Nothing new here. When you pay attention to relevance, Google AdWords delivers extremely well. Bonus Reminder: When you pay attention to relevance on each of your pages, Google’s organic SERPS (Search Engine Results Page) rankings will deliver nicely for you as well. I am sure our clients, and others who take advantage of advertising using Google AdWords, wonder why I frequently talk about landing pages and quality score. Well, they are simply two things you can’t ignore! The people of Google write about understanding landing page experience, and it is important to know what they say about it. It is also important for anyone wanting to maximize their investment in Google AdWords to use the advice they offer. How do your landing pages stack up? The keyword/ad relevance: How relevant the keyword is to the ads. Geographic performance: How successful the account has been in the regions targeted. If targeting the Display Network – The ad’s performance on a site: How well the ad has been doing on this and similar sites. It is important to note the number of times in the above list that Google looks at account performance. It is easy to not worry about a particular keyword or a handful of keywords that are not performing well, but it is a costly mistake to ignore the impact poor performing keywords can have on your ad display placement. Here is more from Google on Quality Score. Seems like I talk about Google AdWords frequently. There is a reason for that. Advertising using Google AdWords just plain works. Those of you using Google AdWords already know the benefits. This blog post is for those still not taking advantage of a very powerful, cost-effective advertising medium. For the last few years, I have been writing (some may say, evangelizing) about using Google AdWords, and extolling its benefits. Since a significant number of our clients are not using AdWords, I obviously don’t convey the message well enough. Now, don’t get me wrong. We have many clients who enjoy the benefits of AdWords in increased, targeted traffic driven to their website for a budgeted amount that they control. They see quantifiable results. They know exactly how many people were delivered to specific pages on their websites, and the keywords their visitors used to get there. If they are also using Google Analytics and the the two accounts are linked, they know much more about their visitors. There are not many other ways to get self-qualified, quantifiable traffic to look at a specific product or service you offer, and at the advertising cost you choose. 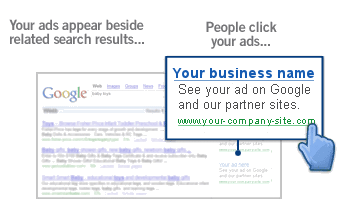 Pay only for results – You’re charged only if someone clicks your ad, not when your ad is displayed. 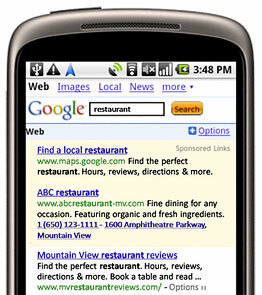 Local ads – Help potential customers find you by showing a business address with your AdWords text ads. You can show your location to people searching for local information on Google.com and Google Maps. Products – extend ads with relevant product details and photos from Google Merchant Center (a way for you to register your company and its list of products with Google). I have just scratched the surface with this blog post of what Google AdWords and we at WebWise can do for you. If you are serious about driving self-qualified, targeted traffic to your website, please email adwords@webwisedesign.com or give us a call at 1-800-281-9993 or 608-822-3750. An inexpensive Google AdWords campaign gets your name, along with a description you control, at or near the top of search results pages and can keep it there while your individual pages get indexed and, if they are created properly with good content, starting earning their way up the organic listing rankings in Google. We announce all new websites we launch for our clients. Those “tweets” show up in Google very quickly. In fact, it happens sometimes in seconds and always in a very few minutes. The URL in that tweet gets indexed as well. There is no waiting for Google to “discover” your website from a link on another website or from your sitemap.xml (ask your webmaster if you have a sitemap.xml). In the example, I did the search about 70 minutes after using Twitter to announce the launch. Even though we tweet about our client websites, we highly recommend that they, and others, use Twitter to get news of their website, not only to those in the Twitter universe, but to Google as well. It only takes a quick tweet and delivers a lot of benefit. Summary: Google AdWords and Twitter, Two quick ways to jump-start your new website in Google search engine results pages. Talking about Pay-Per-Click, Google AdWords mostly, search results and landing pages is pretty much a daily thing around our office. Accordingly, it makes sense to talk about it here. Recently I had the opportunity, thanks to Andy Lewis, to be a part of a Webinar for “The National e-Commerce Extension Initiative” named “Maximizing Your Pay-Per-Click Campaign.” We concentrated on Google AdWords. Why? It is my humble opinion that for most, a limited advertising budget is a reality. Google is the 500-pound Gorilla, and if you are going to feed web advertising money to anyone, it should be Google with over 72% of U.S. searches reported for February, 2009 according to Hitwise. Last week I met with several representatives of one our largest clients, and discussed mostly AdWords and Analytics for the better part of the afternoon. In both cases we talked about Keywords, Ad Copy, Landing Pages at length. Why? Having high placements in Google AdWords or Google organic search results is directly related to those three powerful terms. They rule this world as surely as many of the Triumvirates of history. The importance of Keywords, Ad Copy, Landing Pages, is a simple concept, while not difficult, that is complex in implementation when done correctly. The good news is, you don’t have to spend in inordinate amount of time working on your AdWords campaigns to get some immediate results. Very simply, just make sure your keywords are in your ad copy and on your landing pages (prominently). If you do that, you will see your Click-Through-Rate, aka CTR, improve as well as your placement. If you, or your search professional, spend the time on your landing pages to write keyword-relevant “Titles,” meta “Descriptions,” Headings, and content including the keywords that potential visitors would using when searching for your product, service, or information, and you write quality ads, as well as conducting ad-variant testing, you will be rewarded with increased, targeted, self-qualified traffic. Serious keyword research, a knowledge of how Google likes your pages coded, and knowing how to write and place that code is part of what will take your AdWords campaign to another level. Of course a thorough knowledge of AdWords and your analytics program is necessary as well if you want optimum results. To that end, unless you have a lot of spare time, working with a search professional who has experience and successes on their resume is essential. One of the cool benefits, is that, the time you, or your search professional, spend on your “landing pages” will eventually manifest itself as higher rankings in Google’s search result pages, aka SERPs. Google sells relevance. Make sure your site search strategy, both PPC and organic, includes relevant keywords, ad copy, and landing pages. Keywords, Ad Copy, Landing Pages – The Triumvirate! You may read a detailed explanation by reading their “Google Adwords making Quality Score improvements to go live in coming days” post. I’ll remain from Missouri on their first listed change. We’ll see. The ‘inactive for search’ change will help most people, but especially advertisers with smaller budgets that have unique products and search terms. While the search volume may be low on some terms, the return is not necessarily so. Replacing ‘minimum bids’ with ‘First page bid estimates’ more clearly reflects the metric, and is an improvement. Though, as most often the case, Google is encouraging higher bids with this. That is not necessarily bad, just shouldn’t be constued as an altruistic change. Bottom-line is that almost everyone can benefit from a Google Adwords campaign, and this makes Adwords a little better. So, what is a “Landing Page,” and when and why do you need them? Well, practically all of your pages are, or should be, landing pages. Those of you with PPC campaigns should already understand the importance of landing pages. All of your pages that have been indexed by Google and other search engines are defacto landing pages for search terms that are on your pages. PPC landing pages should be about a specific topic, product, item or event you want to promote or sell. Putting multiple topics, products, items or events on a page will most assuredly not serve you well for PPC landing pages. Nor will they serve you well in organic (so-called free) search results. Your content should be page-specific to compete well (obviously, there are many other factors as well) in organic search results. Talking about more than one thing on a page dilutes the value as far as search engines are concerned. Write pages that clearly and accurately describe your content. Think about the words users would type to find your pages, and make sure that your page actually includes those words within it. Treat all your pages as potential landing pages, and you won’t have to write one specifically for your next Google Adwords campaign. Just choose one that already exists on your site. Good landing pages will help you meet your objectives and exceed your goals.